Today we get to meet the man who has gone from being a police artist to being the person I’m declaring The Official Artist of RV Park Life. He doesn’t look like an artist, I thought to myself as we shook hands, but then again — what does an artist look like? At six-two and two-fifty, with a shaved head and goatee, Jerry Maryniuk looks like a biker or maybe a former linebacker. Then you start talking to him and hear his ready laugh and self-deprecating humor, and realize that he’s easy to get to know. And the first things I wanted to know about him were his memories of his police work and to see his cartoons about life in an RV park. Jerry spent 26 years with the Winnipeg police force. 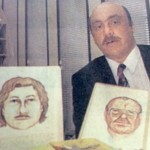 He didn’t start as a “forensic artist” (as the job is known in the profession), but worked a number of assignments, including drug enforcement. 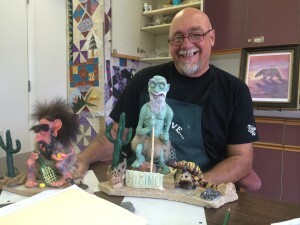 Along the way his artistic gifts were spotted and the Winnipeg police department sent him to the Scottsdale Artists School for training – his first visit to Arizona. From there, he earned an invitation for further training at the FBI Academy in Quantico. 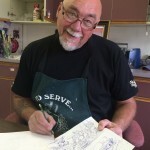 After retiring from police work in his late forties, Jerry became a hunting and fishing guide and eventually he and his wife, Sharon, opened an outfitter service, doing artwork as a hobby. Then his life came apart and he gave up his art. Only when he came to Arizona for an extended vacation did his creative juices begin to flow again. 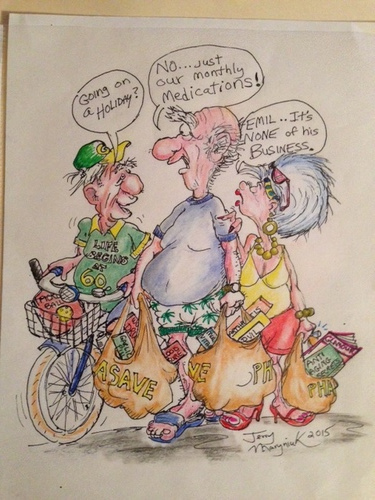 Before long, his creative energy turned to doing a series of scenes from life in an RV park, expressed as cartoons. 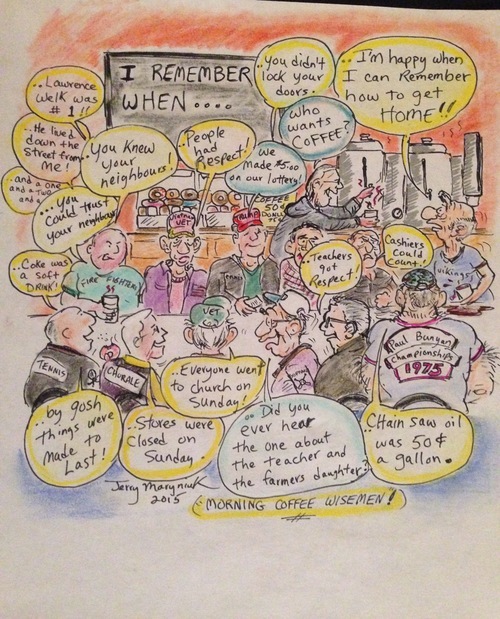 Here is one of my favorites, his depiction of the Wise Men of the RV Park, meeting for coffee and reminiscing. Why did Jerry walk away from art for five years? And what about life in a Mesa RV park brought him back to his gift? It took a tragedy to take Jerry from his art. His son Steve, a vibrant, much-admired kid in his twenties, collapsed, and that’s when they found a tennis-ball sized tumor in his brain. Inoperable and untreatable, they said. So his dad “closed the book on the art” and devoted that energy to an obsessive search to find that elusive miracle cure. There wasn’t one. Four and a half years after being diagnosed, Steve died December 3rd of 2013. Father and son had a long conversation just two months before the end and Jerry asked a question no father should have to ask: What did his son want his legacy to be? That’s when Jerry committed himself to the philosophy that reflected his son’s enthusiasm: NEVER WASTE A DAY. Jerry also wanted to find a charity to support and found himself searching for something like Make-A-Wish, but not just for kids. He found it in AngelsAnonymous.org and organized a fundraiser in honor of his son. That trip to Arizona was the beginning of the healing. They stayed with their friends at The Resort RV Park for 17 days. Jerry knew that his son wouldn’t want his father to stay depressed, but to regain his energy and zest for life, the kind that his son had always demonstrated. Jerry and his wife needed something to look forward to and so decided that they’d come back the next year and rent a place for a couple of months. When no rentals were available, they bought a place. He has donated a number of his pieces to charity sales/auctions, often with the proceeds going to his go-to charity, Angels Anonymous. 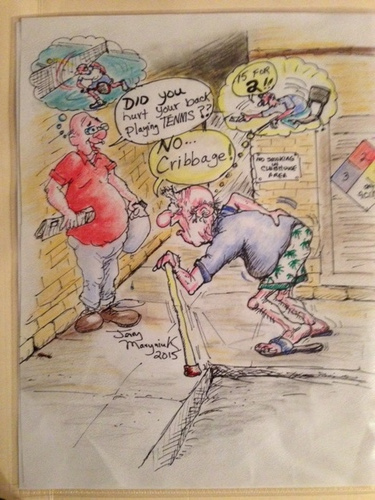 We’ll keep you posted on when the book is available and we hope Jerry will share more of his cartoons with along the way.